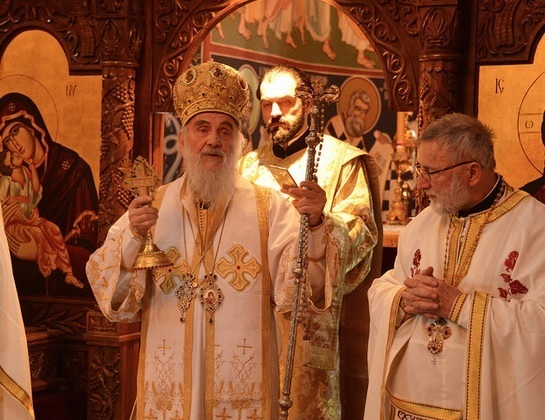 Milton, Ontario - The feast of the Holy Three Hierarchs was solemnly celebrated at Holy Transfiguration Monastery in Milton. The occasion was for the celebration was the chapel Slava of the Saints: Basil the Great, Gregory the Theologian and John Chrysostom. 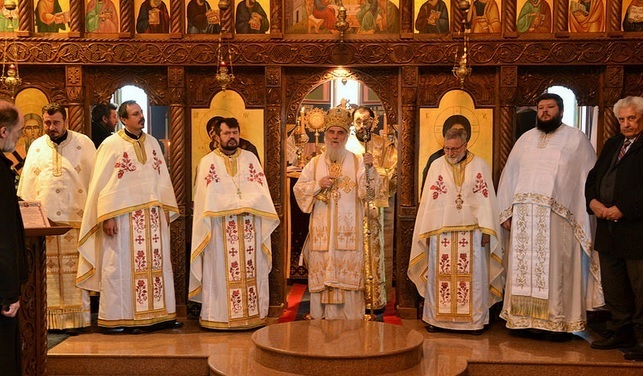 Even though the custom is to serve liturgy in the chapel on this feast, the Hierarchical Divine Liturgy this year was celebrated in the monastery church because of the many faithful who had come to see and receive a blessing from the Serbian Patriarch and administrator of the Diocese of Canada. Concelebrating with the patriarch were V. Rev. Stavrophor Vasilije Tomic and V. Rev. Stavrophor Milojko Dimitric, Protonamesnik Aleksandar Crnogorac, Fr. Ivan Radovic and Fr. Jovan Marjanac and Protodeacon Damjan Bozic and Deacon Djuradj Kojic. Chanting at the chanter's stand were diocesan clergy. Besides the many faithful who had come to celebrate this feast, attending the liturgy was our famed basketball star Vlade Divac with his wife Ana. After the dismissal His Holiness awarded the benafactor of our Church and Serbian people Rebecca McDonald the Award of St. Sava in the second degree. Mrs. McDonald helped and continues to help our people in the Serbian lands as well as the Church of God in Canada and was thereby honored to receive this award of our Holy Church. Following the distribution of the antidoron, the cutting of the Slava Kolach and blessing of the Koljivo was done in the monastery trapeza, which was served by His Holiness. This year's kum was Protosindjel Vasilije while next year's kum will be Rebecca McDonald. The slava meal followed the prayer service. The St. Nicholas Church - Barton St - Kolo Sestara prepared the meal. Protosindjel Vasilije addressed everyone during the lunch, thanking His Holiness and all in attendance who took time out of their schedules to take part in this great Slava celebration of the Holy Three Hierarchs.